Coca-Cola is renowned for its dividend, but investors should let the stock come down to a more reasonable valuation before buying. The Coca-Cola Co. (NYSE:KO) is prized for its long history of enriching shareholders. It is particularly loved by income investors, thanks to the company's extended track record of dividend payments. Coke recently raised its dividend for the 53rd year running, which places it near the top of the list of Dividend Aristocrats: the companies that have increased their payouts for at least 25 consecutive years. But being a crowned king of dividend payers doesn't automatically make Coca-Cola a good stock to buy at all times. In addition to returns generated by dividends, investors should also be concerned with a stock's total return potential. This is when valuation must be assessed, and Coca-Cola's stock is too aggressively valued. While the company has a rock-solid dividend, the risk/reward proposition isn't appealing enough to invest. 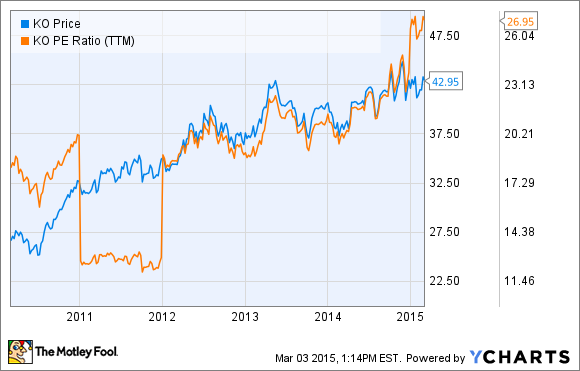 Coca-Cola shares currently sit at $43 per share, which represents a 10-year high. As you can see, Coca-Cola investors have had a great run over the past few years. But the company's underlying growth has also slowed. Last year, Coca Cola's revenue declined 2% and its earnings per share fell 16%. To be fair, currency effects from the strengthening U.S. dollar took a large bite out of Coca-Cola's results. Nonetheless, global case volume of Coca-Cola's sparkling beverages grew just 1% for the fourth quarter and full year, and the core Coca-Cola brand was flat for 2014. Coca-Cola's revenue and earnings per share were actually lower last year than in 2011. The company earned $1.60 in diluted EPS in 2014 on $46 billion in revenue. In 2011, revenue and diluted EPS were $46.5 billion and $1.85 per share, respectively. Coca-Cola takes pride in its diversified portfolio of brands. Indeed, the company has more than 20 brands that each rake in at least $1 billion in annual revenue. It is also expanding into newer categories, such as juices and teas. But the core Coke and Diet Coke brands still make up the majority of Coca-Cola's revenue and profit, and those categories aren't growing much. And yet, shares of Coca-Cola have rallied significantly since 2011. But as you can see in the following chart, most of the returns have come from multiple expansion, and not earnings growth. Essentially, when viewing Coca-Cola's P/E, it's clear the "P" has gone up, but its "E" hasn't -- and that spells trouble. Coca-Cola's P/E multiple of 27 is very close to its 10-year high and also considerably exceeds the S&P 500 multiple, which is closer to 20. This poses a problem for investors buying in at these levels. If earnings don't grow significantly, the stock likely will suffer multiple contraction going forward. Management's outlook doesn't inspire much confidence. In the fourth-quarter conference call, Coca-Cola management referred to 2015 as a "transition" year, because it will take time for its media investments to pay off. In addition, Coca-Cola expects the currency headwind to continue. The global consumer environment is projected to remain volatile, with elevated geopolitical risk weighing on growth in emerging markets. Because of all this, Coca-Cola expects just mid-single-digit earnings growth excluding currencies. That won't justify a 27 P/E. Coca-Cola has a long history of raising its dividend, which makes it a top holding among income investors. But even a great company like this can be a bad investment if too high a price is paid. For all its qualities, Coca-Cola is simply too aggressively valued given its weak growth. The company isn't likely to grow enough to justify its valuation. This will make it difficult for investors to earn satisfactory returns going forward. 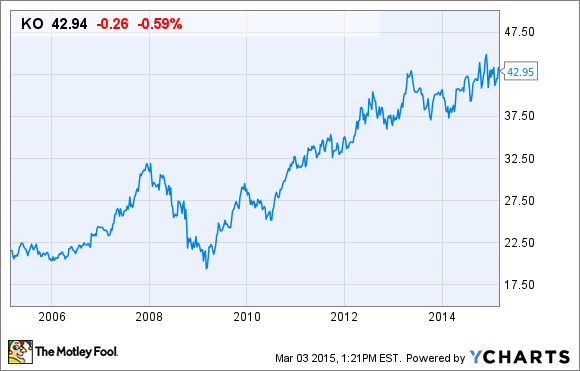 While Coca-Cola is a great business, it's not a good buying opportunity right now. The company offers a nice 3% dividend yield. But investors should wait for its valuation multiple to come down before buying the stock.